After a successful season at the Venice Biennale, in Paris and Christchurch, Michael Parekowhai’s On First Looking into Chapman’s Homer will make its final stop at the national museum, Te Papa. Opening Saturday 25 August, a specially reconfigured installation will be shown in a single gallery space for four weeks and provides an exciting opportunity to view Parekowhai’s Venice exhibition. 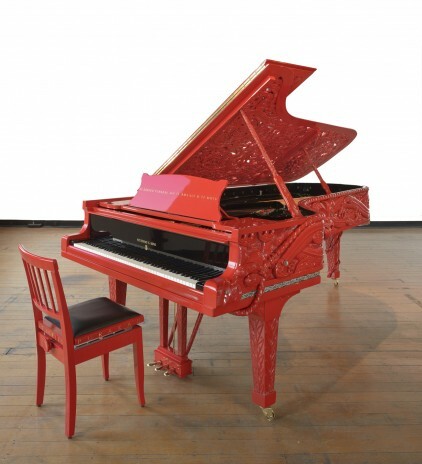 The centerpiece of the installation is an ornately carved Steinway concert grand piano. Painted a vibrant red and titled He Korero Purakau mo te Awanui o te Motu: story of a New Zealand river, it is Te Papa’s latest major acquisition of contemporary art. Standing alongside He Korero Purakau mo te Awanui o te Motu: story of a New Zealand river are two black bronze replica pianos complete with two bulls, one standing and one sitting, as well as five bronze olive tree saplings. Over the four weeks He Korero Purakau mo te Awanui o te Motu: story of a New Zealand river will be performed by top musicians including Gareth Farr, Robert Wiremu and Tama Waipara, and at 12.30pm daily by pianists selected to play this unique piano when it was exhibited in Venice. In the adjacent galleries Te Papa presents new acquisitions of important works by Jim Allen and Colin McCahon, including McCahon’s painting Koru 1, 2, 3 (1965). Te Papa would like to acknowledge the support of the Friends of Te Papa, Ernst & Young, Creative New Zealand, and the Wellington City Council.